Britain’s participation in the Revolutionary and Napoleonic wars (1793-1815) was continuous except for two short breaks that lasted a few months only. During two decades of warfare the Royal Navy fought six major fleet actions, and several much smaller ones, and it is these encounters, typified by Trafalgar, that tend to dominate the popular image of the sea war. Running continuously through the period however were lesser, but no less deadly, engagements in which smaller British units struck hard at enemy commerce and sought to establish physical as well as moral superiority along the enemy’s coasts. Key elements in such attacks were “cutting out” operations, in which pulling-boats loaded with seaman and marines attacked moored enemy ships, usually at night, to capture them and take them out to sea. This dangerous activity, which did however bring with it the prospect of prize-money for all involved, was one in which the Royal Navy was to prove expert. There are few more desperate and successful examples of this tactic than the cutting out of the Dutch brig Atalante in 1804. Through most of this period the Netherlands were occupied by the French and proved to a great extent a reliable ally. 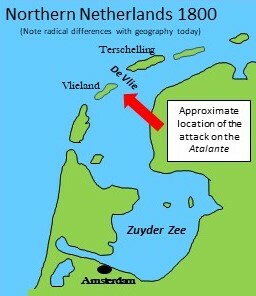 Royal Navy operations off the Dutch coasts were however complicated by shallow waters and shifting sandbanks, most especially in the area of the Friesian Islands. This string of low, sandy islands lies parallel to the north coast and they dominated what were, at that period, the sea-approaches to Amsterdam and towns along the shores of the shallow Zuider Zee. (The latter no longer exists, due to land reclamation, and since 1870 access to Amsterdam has been through a West-East ship canal. Today’s geography looks radically different to what it was in the early 19th Century). One of these sea-approaches, known as the Vlie, lay between islands of Vlieland, to the southwest, and Terschelling, to the northeast. In March 1804 two of the ships tasked with watching the Vlie to prevent Netherlands privateers slipping out into the North Sea, were the sloops-of-war HMS Scorpion and HMS Beaver. 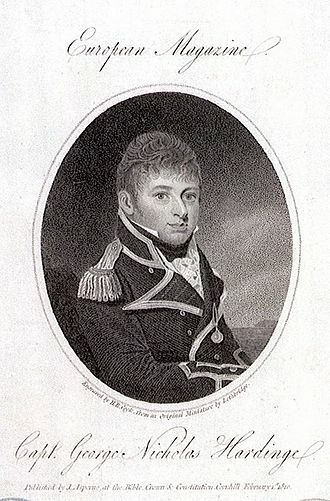 The Scorpion was under the command of Commander George Nicholas Hardinge (1781 – 1808) who, though only twenty-three, had already accumulated a notable service record and promised to merit high command. 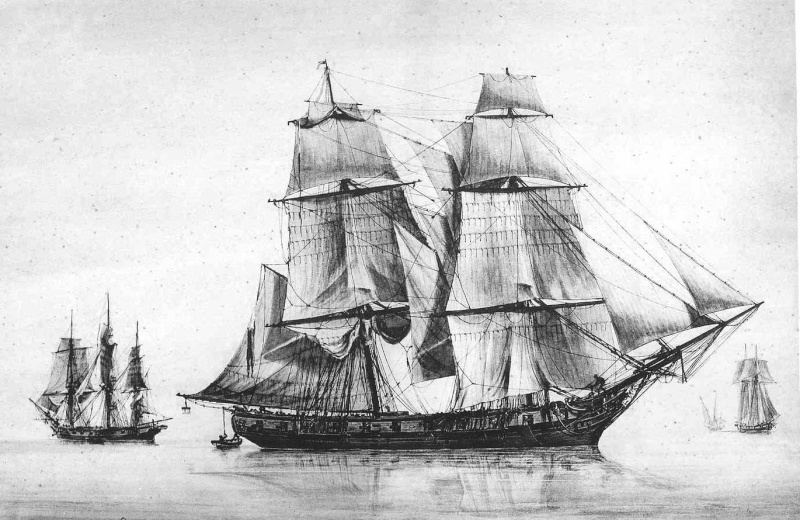 The recently constructed Scorpion was one of the first of the Cruizer class of brig-rigged sloops, 106 of which would enter service by the war’s end. Of only 100-ft length and 382-tons, these proved enormously successful. With a crew of only a hundred men, these vessels were so heavily armed – typically with two 6-pounder long-gun bowchasers and no less than sixteen 32-pounder carronades – that they could deliver a broadside-weight comparable to that of a frigate, but with a third of the manpower. Command of such a vessel – which Hardinge had succeeded to two years before (at the age of twenty-one!) – was a prize that all young officers would aspire to. On 28th March, patrolling north of the Vlie, Hardinge spotted two Dutch corvettes – heavily armed brigs – at anchor deep inside the waterway. Lacking detailed knowledge of the shoals flanking the approach, he realised that direct attack by the Scorpion must be ruled out. With sufficient men available, a cutting-out operation might be feasible, but Scorpion’s crew alone would be insufficient to provide the necessary numbers. Three days later however, on March 31st, the Scorpion was joined by the Beaver, the commander of which, Charles Pelly, was as enthusiastic as Hardinge about a cutting-out operation, for which there were now sufficient men. The account that follows draws heavily on a letter written soon afterwards from Hardinge to his father, which I found in Edward Giffard’s “Deeds of Naval Daring”, published in 1852. I quote from it as appropriate. Forty-eight hours passed. “Two of the boats had broken adrift from us, two had swapped alongside. The wind shifted again, and we made a push to extricate ourselves, but found the navigation so difficult that it required the intense labour of three days to accomplish it. We carried the point at last, and were commended by the Admiral for our perseverance. You will see in the Gazette my letter to him.” The Atalante had suffered five killed, including the captain, and eleven wounded. Hardinge, a courageous and humane man, was still troubled over the death of the Dutch captain, named Guillelmo Swedenryk Carp (1775-1804): “To the end of my existence I shall regret the Captain; he was a perfect hero; and if his crew had been like him, critical indeed would have been our peril.” In a post-script to the letter Hardinge noted that “In two days after the Captain’s death he was buried with all the naval honours in my power to bestow him. During the ceremony of his interment the English colours disappeared and the Dutch were hoisted in their place. All the Dutch officers were liberated, one of them proclaimed the eloge (eulogy) on the hero they had lost, and we fired three volleys over him as he descended into the deep.” It is pleasing to note that the British squadron commander off the Friesian coast allowed the late Captain Carp’s servant to return home under a flag of truce to bring his personal effects to his family. Hardinge’s success was rewarded with immediate (ten days after the attack) promotion to coveted post-captain rank, one of the few who attained this at such a young age. For all his courage, chivalry and promise, his subsequent career was to be tragically short. 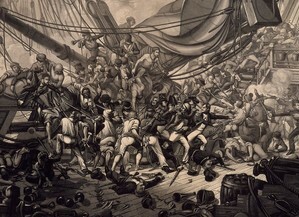 While in command of the old frigate HMS St Fiorenzo in the Indian Ocean in 1808, he was killed in the course of an epic three-day battle with the French frigate Piémontaise. But that’s another story. Even at two centuries’ remove, the death of such an inspirational twenty-seven-year-old leader of men is painful to contemplate.